Locusts get a bad rap—noise and plagues!—but they’ve inspired Israeli engineers to make bug-like robots that could be a godsend in emergencies. 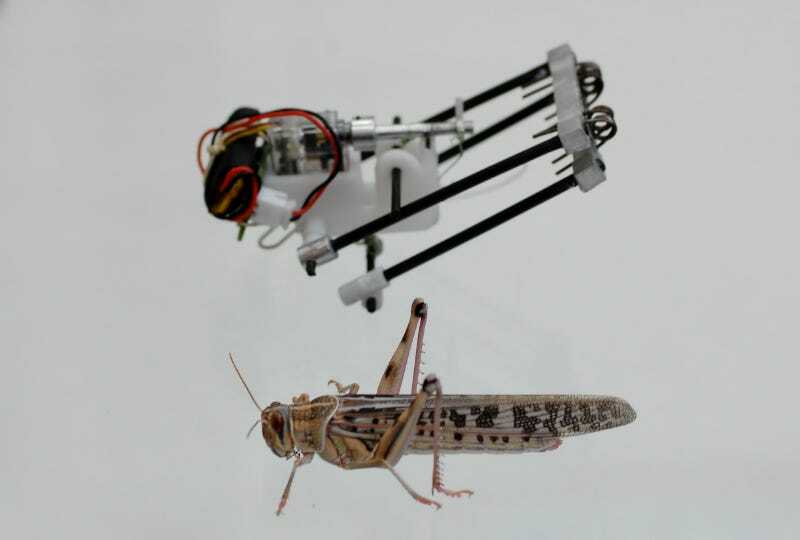 A team at Tel Aviv University has developed a five-inch long, locust-inspired robot that weighs an ounce and jumps a whopping 11 feet high and 4.5 feet wide. Their findings were published last month in the journal Bioinspiration & Biomimetics. Given its agility and feather-like weight, it could hop along any terrain and gather data in hard-to-reach nooks and crannies for crisis responders and search-and-rescue squads. Miniature robots like these are of particular interest to engineers, since they’re cheap and quick to make. This little guy’s body is made out of 3D-printed ABS plastic (the same material that’s used to make Legos) and has carbon rods for legs. The battery-powered bug catapults itself by first bending its legs, then snaps them into place at the joint, and finally unlocks a flexor “muscle” in the upper leg. That sudden burst of energy triggers a kick-like motion that flings the thing into the air, similar to a real locust’s locomotion. The animal kingdom is a popular place for roboticists look for design ideas. Earlier this year, the Marines unveiled a four-legged, mini-Big Dog that could scout dangerous buildings ahead of troops. The University of Pennsylvania, meanwhile, has been focusing on biomimetic drones: UAVs that have eagle-inspired grasping claws and ant-like AI that lets flocks of drones gather and fly in tightly choreographed swarms. “Jumping is one of nature’s solutions to the challenge of mobility in difficult terrain,” the Tel Aviv University paper states. Sending tiny jumping robots to go where humans can’t in earthquake-ravaged cities or ruined nuclear plants could make search-and-rescue easier. So, thanks, pests of the world: you continually inspire scientists to develop potentially life-saving technology.